This almost square post office is enlivened by the verticality of its windows and the two stairtowers. 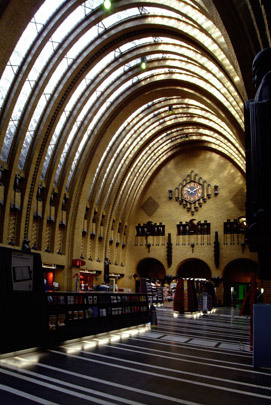 A narrow passage leads to the imposing main space (30 x 16 x 18 m.) spanned by parabolic arches of yellow glazed brick and lit by intermediate parabolas of cut glass. The floor slabs are faced with black freestone and courses of white marble. The walls above the semi-circular service windows contain decorations redolent of the Amsterdam School.